An unstoppable virus. Humanity’s last stand has failed. “Mad Max meets Day of the Triffids”, “Simply unputdownable”, “Terrifyingly realistic”. At the end of the world, surrounded by the tidal waters of the Solent, the survivors of a pandemic flu virus hide behind the high walls of a Tudor fortress. Scraping a living far away from the smoking ruins of the cities, they wait in hope. Hurst Castle stands alone. Its seventy-four occupants united in a struggle for survival against all the odds. The Millennial Virus is the least of their concerns. When the arrival of outsiders threatens to tip the balance of power, the people of Hurst are faced with a desperate choice: set aside their differences and join an alliance that promises new hope or unite against the newcomers and their plans for reconstruction. Who can be trusted? Only time will tell. 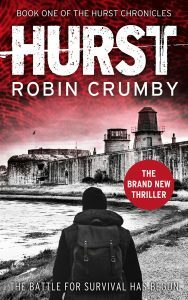 If you enjoy fast-paced, post-apocalyptic stories such as The Day of the Triffids, The Road, Station Eleven, The Stand, and The Atlantis Plague, you’ll love The Hurst Chronicles series.